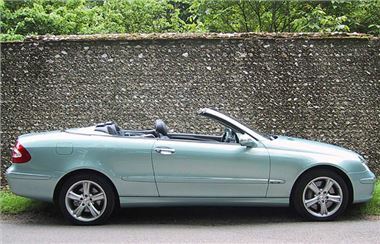 Values of used prestige-brand cabriolets have fallen to an unprecedented low, according to Glass’s. The publisher of used car dealer ‘bible’, Glass’s Guide, reports that year-old prestige drop-tops are worth up to 24 per cent less than in March 2008 (see table below), and signals that now could be the ideal time to buy in advance of anticipated price rises in the run up to summer. Glass’s compared values of one-year-old roadsters (e.g. BMW Z4), upper-medium cabriolets (e.g. Audi A4 Cabriolet), and luxury sports soft-tops (e.g. Jaguar XK Convertible) in March 2008 versus March 2009. Every vehicle suffered additional depreciation of at least 17 per cent. The greatest additional fall in value was for the Mercedes-Benz SLK 280, with a one-year-old example worth 24 per cent less this month than an identical car of the same age in March 2008. “Values of prestige roadsters and cabriolets have traditionally outperformed those of most other segments, but latterly they have been hit hard by the decline in consumer spending,” explains Richard Crosthwaite, Prestige Car Editor at Glass’s. “These cars are often seen as a luxury item; not required to meet day-to-day transport needs. Significantly, the availability of these cars on the used market is also now at record levels, thanks to strong growth in registrations over recent years. The fall in demand, coupled with the increase in supply, is a double-whammy that has led to inevitable and dramatic falls in trade values. Crosthwaite adds that the value of a prestige-brand convertible or roadster is sensitive to specification, benefiting particularly from the presence of satellite navigation, leather upholstery, heated seats and larger wheels. For more information visit EurotaxGlass's online at www.eurotaxglass.co.uk (trade) or www.glass.co.uk (consumer). Spring must be here as LloydsTSB Autolease/Black Horse is staging the first in a series of special Convertible sales with BCA. The first will take place at the Blackbushe auction centre on 11 March. LloydsTSB Autolease/Black Horse will offer around 100 convertibles, with the selection ranging in value from under £4,000 to over £40,000, meaning there is something for everybody. The sale is open to all buyers. The event features cars entered direct from LloydsTSB Autolease/Black Horse, with a mix of business, ex-lease and finance cars.